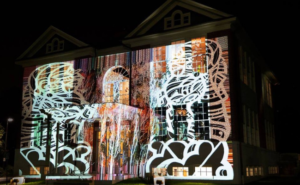 The visual arts in Arlington can be found everywhere in the community: from exhibitions on the Arlington ART Bus, to projections on building facades. Even residents create their own works like during our How to Video Festival. Learn more about our programs and how you can get involved. Art on the ART Bus is a mobile gallery on one of Arlington County’s ART buses. Run by Arlington’s Special Projects Curator, Cynthia Connolly, this unique bus features original works of art. This dynamic connection between public transit and original art makes the commute as exciting as the destination, cultivating a vibrant arts experience for transit in Arlington County, Virginia. Initiated in December 2010, this bus rotates throughout the different routes available to ART bus passengers. Learn more about the program and view past exhibits. Courthouse 2.0: Reimagining the Civic is a public art initiative aimed at sparking public conversation about the future Courthouse Square by exploring the interaction between civic space and civic life in Arlington in the twenty-first century. We see Courthouse as the symbolic heart of Arlington, a public ‘town square’ where all Arlingtonians can gather to create, celebrate, or to simply relax. Courthouse 2.0: Reimagining the Civic encompasses a variety of projects including temporary/semi-permanent public art, performances, lectures, exhibitions and pop-up activations. Learn more about these past and upcoming projects! Arlington boasts an award-winning Public Art collection with over sixty permanent public art projects commissioned by the County, developers, and initiated by individual communities since 1979. We have hosted more than 40 temporary public art projects and are monitoring about 25 developer projects at any given time. Our projects have received numerous awards, including seven Americans for the Arts Public Art Year in Review Awards .Learn more about the permanent collection, self- guided tours, the Public Art Master Plan, and resources for developers here. Arlington Arts Center and Arlington Arts will be hosting their 15th annual Día de los Muertos celebration on Saturday, November 3 from 5 to 8pm. Join us for family-friendly art projects, face painting, live dance performances by Ballet Folklorico Mi Herencia Mexicana, and traditional mariachi music by Mariachi Aguila. Mexican hot chocolate and pan de muerto will be served at AAC with delicious tacos from local food trucks available on our lawn. The event will feature a spectacular, artist-designed projection on AAC’s facade, further exploring the Día de los Muertos theme in visual form. 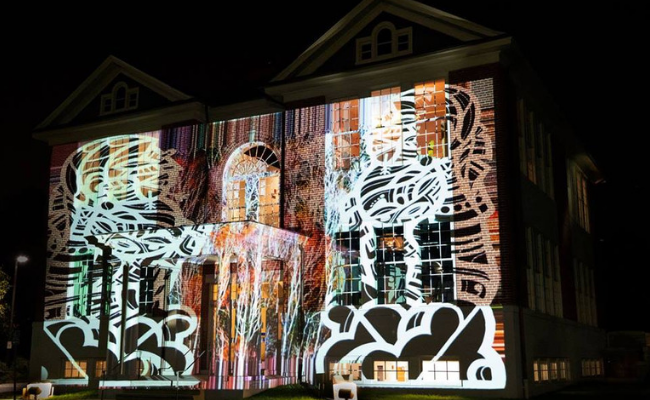 This projection is a collaboration between MasPaz and Bell Visuals. MasPaz is a Latino artist born in Bogota, Columbia; raised in Washington, DC; and currently living in Arlington, VA. His murals and public art projects combine influences from Latin American culture with the aesthetic of contemporary street art. Robin Bell, founder of Bell Visuals, is a multimedia artist based in Washington, DC, whose video collage work combines creativity and political activism. Día de los Muertos: A Cultural Legacy, Past, Present & Future is part of Pacific Standard Time: LA/LA, a far-reaching and ambitious exploration of Latin American and Latino art in dialogue with Los Angeles. Pacific Standard Time is an initiative of the Getty. “…the full-dome projection series [is] one of the best and most innovative projects in the region.” (City Paper, “Best in Galleries, 2017”). 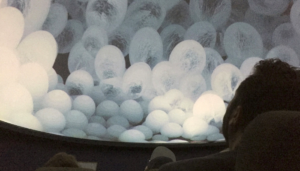 In partnership with Arlington Arts, the Friends of Arlington’s David M. Brown Planetarium presents all four abstract animation works commissioned for the planetarium dome. Created by prominent visual artists from the region, were premiered in the planetarium over a period of two years. The works are: “In This Convex Hull” by Brandon Morse (pictured); “In the Midst of the Inferno” by Jonathan Monaghan; “Nova” by Shannon Collis; and “Babel” by Kelley Bell. Program duration: aprox 45 minutes. The “How To” Video Festival features screenings of instructional videos that are informative and entertaining created by residents of Virginia, Maryland, and Washington, DC. Prizes include: $250 Best Video Prize provided by the Friends of the Arlington Library, as well as an award for the Best “How To Library” video. There’s also a $250 People’s Choice award given to the video the audience votes for the most provided by LMO. The 2017 competition jurors were This year’s jurors are Katelyn Attanasio – Arlington Public Library Maker Librarian and Paul Shortt – Arlington Cultural Affairs New Media Curator. Winner of both Best Video and Audience Choice Awards both went to Elaina Talbot. See her winning video above!